Macy's was founded in 1858 by Rowland Hussey Macy, who established a dry goods store in downtown Haverhill, Massachusetts in 1851. He moved to New York City and established a new store named "R. H. Macy & Company" on the corner of 14th Street and 6th Avenue, later moving to 18th Street and Broadway, on the "Ladies' Mile", the 19th century elite shopping district, where it remained for nearly forty years. In 1896, R. H. Macy's was acquired by Isidor Straus and his brother Nathan, who had previously sold merchandise in the store. In 1902 the flagship store moved further uptown to Herald Square at 34th Street and Broadway, the former site of Koster & Bial's Music Hall once stood and where Thomas Edison first projected his Vitascope motion picture. The new Macy's store, built to the design of architects De Lemos & Cordes, was sheated in a Palladian facade and proclaimed "the largest store on earth" with 9 stories and 33 elevators and 4 escalators and pneumatic tube system. Although the store initially consisted of just one building, it expanded through new Art Deco additions by architect Robert D. Kohn, eventually occupying almost the entire block by 1924. The only exception is, to this date, one small brownstone on the corner of 34th and Broadway, which remains a separate property. Macy's rents it annually for a legendary sum and camouflages it with giant signs. Macy's was the first retailer to promote a woman, Margaret Getchell, to an executive position, and pioneered such revolutionary business practices as the one-price system, in which the same item was sold to every customer at one price, and quoting specific prices for goods in newspaper advertising. Known for its creative merchandising, Macy's was the first to introduce such products as the tea bag, the Idaho baked potato and colored bath towels. 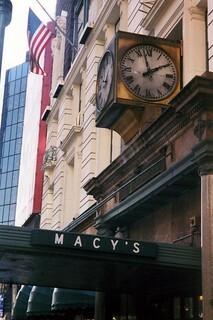 Macy's was also the first retailer to hold a New York City liquor license.